You are at:Home»Places»Jerusalem»October 21, 1096: The First Crusade Was Not the First Crusade! October 21, 1096: The First Crusade Was Not the First Crusade! On October 21, 1096, a Seljuk Turk army led by Sultan Kilij Arslan I massacred a Christian army from Europe, known as the People’s Army, ending the first of the religious wars known as the Crusades. This particular “Crusade” is not considered an “official Crusade,” a distinction reserved for the Catholic Church sanctioned invasion of the Middle East (i.e., Holy Land) a year later. The so called “People’s Crusade,” “Popular Crusade,” “Peasants’ Crusade” or “Paupers’ Crusade” was the work of a charismatic French monk called Peter the Hermit. In keeping with the multiple names theme, Peter was also known as “Little Peter” or “Peter of Amiens.” Just to complicate the name business even more, it is possible Peter’s real name was something like Pierre L’Ermite or Pierre L’Hermite. Some scholars believe Peter may have been Dutch and not French. Dressed in rough, simple clothes and riding a donkey, Peter had once attempted a pilgrimage to Jerusalem but was stopped by the Turks. The prevention of his travel may have given him incentive to lead a Christian Crusade to return the Holy Land to Christendom. Unlike the First Crusade in 1097, Peter’s Crusade did not have the sanction of the Pope, although Peter did obtain permission from the Patriarch of Jerusalem (the senior Christian clergyman in Jerusalem). It is possible Peter got his motivation from the preaching of Pope Urban II at the Council of Clermont in 1095 in which the Pope called for a Christian Crusade to seize the Holy Land from the Muslims. In either case, Peter inflamed anti-Islamic feelings and Christian fervor in England, France, Lorraine, and Flanders. It is possible Peter actually did have the sanction of Pope Urban II as well, though as with other details, the facts are debatable. Another possible reason for the religious fervor that inspired Peter and his followers was a common belief that the end of the world was nearly upon them. Peter drummed up support and participation among the peasants who had been suffering economic hardship and hunger from drought, leading to their willingness to join in the adventure. Minor knights and nobles also joined, with the military leadership provided by Walter Sans Avoir, the lord of Boissy-sans-Avoir in the Île-de-France region. Peter and Walter led their respective columns of peasants and knights on the long overland march to the Holy Land, first passing through the Holy Roman Empire (HRE), or what is modern Germany. The combined columns of Crusaders numbered as many as 40,000 as throngs of peasants, women and children joined in the march. Reception of Walter Sans Avoir by the King of Hungary, who permitted him to pass through his territory with the Crusaders. A frequent rumor that the throngs of illiterate peasants had no knowledge of geography and mistakenly believed every town or city they encountered enroute was Jerusalem or another city in the Holy Land is unlikely as their leaders were better acquainted with such geography and some may have already gone on pilgrimage prior to the People’s Crusade. That said, many of the uneducated Crusaders may well have been confused and ignorant of exactly where they were and where they were going. Marching through France and Germany from April of 1096, the Crusaders pillaged and murdered Jewish homes, business and settlements along the way. Possibly untold thousands of Jews were murdered, notably about 800 Jews in Worms and over 1000 Jews in Mainz. In Speyer, a larger massacre was averted when the local Bishop saved all but 12 of the local Jews by ransoming their lives with a large payment to the Crusade. Jews not murdered or escaped were forced to convert to Christianity or face death. Estimates of Jews so murdered range from 2000 to 12,000, and many local leaders and church officials took part in the opportunity to eliminate Jewish presence in their towns. By July of 1096, as much as 25% of the Jewish population of Northern France and Germany was dead. The contingent led by Walter Sans Avoir (sometimes, but wrongly, called Walter the Penniless as his name seems to mean “Without Property” when it really meant “Without Fear”) marched ahead of those led by Peter the Hermit, passing through Hungary on their way to Constantinople in what is now Turkey. Unfortunate incidents occurred in the Balkans as some of the Crusaders thought nothing of stealing or pillaging and locals looked at the Crusader columns as invaders. Peter’s group followed, now numbering 40,000, and their march through the Rhineland resulted in more atrocities, often referred to as the “German Crusade of 1096.” Peter’s column encountered signs of the friction between Walter’s column and the locals in Hungary, and further troubles occurred resulting in perhaps 4000 Hungarians killed by Crusaders. 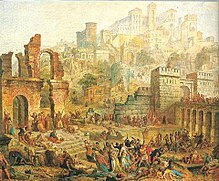 Belgrade was the next victim of the “Crusade” as the city was ransacked and burned. The city of Nis in what is now Serbia reacted strongly to Crusaders burning a mill, resulting in a military action against the Crusaders that killed about 10,000 of the Crusaders! As you can tell by now, the great march of Crusaders was creating massive problems for those on the Crusade and those the Crusaders encountered, and the Crusaders had not even reached Asia Minor yet. When Walter arrived in Byzantium the Byzantines were somewhat perplexed as to how to treat the large number of European Crusaders. 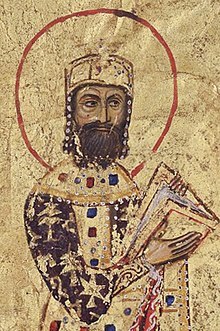 Alexius I Comnenus, Emperor of the Byzantines, hastily decided to ferry the first large contingent of Crusaders across the Bosporus to Asia Minor as quickly as possible to rid his capital of the barbaric horde. As the Crusading columns were anything but orderly, Peter and Walter both had arrived in Constantinople in August of 1096 with about 30,000 Crusaders, with a larger number of their horde still en-route. Walter and Peter agreed to the hasty movement of their forces on hand across the Bosporus and continued their journey. Once in Asia Minor (modern Anatolia) further friction developed between the French and their German and Italian fellow Crusaders resulting in a split in the Crusader forces. About 6000 of the German led Crusaders captured a fortress at Xerigordos, but were in turn besieged and ended up being massacred, with survivors taken as slaves. 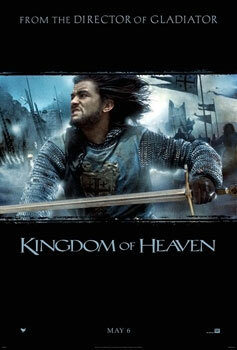 Theatrical release poster for Kingdom of Heaven (2005), an epic historical drama film set during the Crusades of the 12th century. Madden, Thomas. The Concise History of the Crusades. Rowman & Littlefield Publishers, 2013. Weidenkopf, Steve. The Glory of the Crusades. Catholic Answers, 2014. The featured image in this article, Peter the Hermit Preaching the First Crusade from the painting by James Archer from Cassell’s History of England, Vol. I from http://www.gutenberg.org/ebooks/48451, is in the public domain in the United States. This applies to U.S. works where the copyright has expired, often because its first publication occurred prior to January 1, 1923. See this page for further explanation. Previous ArticleOctober 22, 2018: Additional Chances to Preview Hunter Killer!